In the business glossary, provision implies money set aside to cover an anticipated liability or loss. Look the other term Reserve, reserves refer to withholding some amount for any use in future. Provision and reserves are two terms which are highly confused, but they carry different meanings. While running a business, some expenses or losses relate to the current financial year, but their amount is not known, as they are not yet incurred. For such expenses/losses provision is created, as a charge against profit. Likewise, a certain portion of the profit is retained in the business as reserves, to utilize them at the time of need, or to invest it in growth activities, or to cover future contingencies. Reserves are the only appropriation of profit. 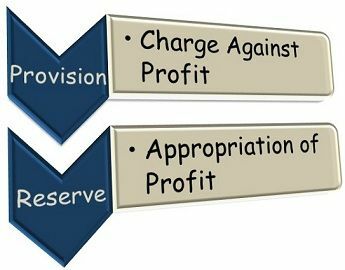 So, the basic difference between provision and reserve is that net profit is calculated only after giving effect to all provisions, whereas reserves are created only after reckoning profit. Check out the article to know some more differences. Meaning The Provision means to provide for a future expected liability. Reserves means to retain a part of profit for future use. Presence of profit Not necessary Profit must be present for the creation of reserves, except for some special reserves. Appearance in Balance Sheet In case of assets it is shown as a deduction from the concerned asset while if it is a provision for liability, it is shown in the liabilities side. Shown on the liabilities side. Compulsion Yes, as per GAAP Optional except for some reserves whose creation is obligatory. Payment of Dividend Dividend can never be paid out of provisions. Dividend can be paid out of reserves. Specific use Provisions can only be used, for which they are created. Reserves can be used otherwise. The Provision means to keep aside a particular sum of money to cover up an anticipated liability which arises from the past events. It is a recognition of an expected obligation, which will result in the outflow of cash from the business. The amount of the liability should be easily estimated by the entity to provide for it. The recognition is to be made to provide for a known liability or decrease in the value of assets over time or a disputed claim whose probability of occurrence is maximum. If a provision is made in excess of the amount what is required, then after paying off the liability, it needs to be written back to the profit and loss account. For purchasing an asset in future. To pay the dividends to shareholder consistently year by year. For meeting out unexpected contingencies. Many accounting and business experts are of the view that it is always considered good to save some money for an uncertain future. That is why companies create reserves for conserving money to meet out the future losses. The Provision means to keep some money for a known liability which is probable to arise after a certain time. The Reserve is to retain some money from the profit to for any particular future use. The amount of provision cannot be used to pay off dividends, but the amount of the reserves can be used for so. The creation of a provision is compulsory against the anticipated liability. Conversely, the creation of reserves is voluntary except in the case of Capital Redemption Reserve (CRR), and Debenture Redemption Reserve (DRR). The use of provision is specific, i.e. it must be used for which it is created. On the other hand, reserves can be used otherwise. Provisions are deducted from the concerned asset when it is created against an asset while shown as a liability on the balance sheet when it is created against liability. As opposed to Reserves, which are shown on the liabilities side. It is immaterial for the creation of provision, whether the company earned the profit or not whereas the company must earn the profit for the creation of reserves. Provision and Reserves both decreases the profit, but the creation of provision is a must to cope up with the known future expense. Liabilities must be recognized as and when they arise, and that is why provisions are made for the same. Reserves are a little different; they are created to preserve some money for bad days because nobody knows what will happen in future, and so experts are in favor of creating reserves. Thank you for giving me an understandable meaning for reserves and provisions. Now I have got a clear idea about these two terms. Effective to understand difference between provision and reserve.